A choking person’s airway may be completely or partially blocked. A complete blockage is an urgent medical emergency. A partial obstruction can quickly become life threatening if the person loses the ability to breathe in and out sufficiently. Without oxygen, permanent brain damage can occur in as little as 4 minutes. Rapid first aid for choking can save a life. 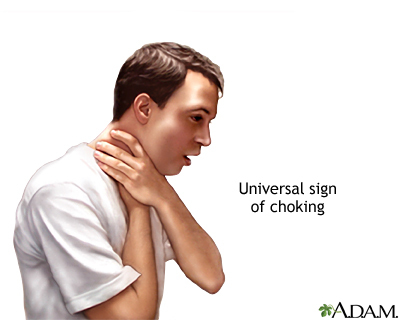 The universal distress signal for choking is grabbing the throat with one or both hands. DO NOT perform first aid if the person is coughing forcefully and able to speak – a strong cough can dislodge the object on its own. 2. Send someone to call 911 or your local emergency number.